Lake Villa Guatemala is a luxurious lake-front villa on the south shore of Lake Atitlan, between Cerro de Oro and Santiago Atitlan. This lovely, secluded space is perfect for family groups or those looking for a retreat or private get-away. The home is beautifully furnished and spacious (4000 sq ft); on 3 levels leading to the garden and the lake shore. The upper, entrance level has a huge open-plan area with a fully-equipped kitchen, dining area, and a large living area with fireplace leading out to a large terrace with hot tub. This is the perfect spot for morning breakfast or sunset cocktails! Musicians will appreciate the piano and guitar in the living room. The second floor has a large bedroom with King and Matrimonial (Double) beds. There is an additional Futon bed in the living/meditation space on this level. This is the perfect place for your yoga practice! The bottom level has two large bedrooms, both with views of the lake, en suite full bathrooms, private entrances leading to the balcony and the lake. One room has two Queen beds; the other has a King bed. The lush, landscaped gardens slope gently down to the lake. Like to swim? Swim in the cool Lake Atitlan waters from our private beach and dock, or explore the lake in one of our two kayaks. Furnishings through the home are handmade by Guatemalan craftsmen. The whole house has a water-filtration system, so that water is safe to drink from the faucets--a real luxury in Guatemala! The house runs on grid-tied solar power with battery backup, so you don't even notice those occasional Guatemala power outages. The solar water heater supplies plentiful hot water, with a gas water heater backup for those extra cloudy days. WiFi is available throughout the house. Our private boat is available for trips to explore the lake. The boat rental rate includes the boat captain and fuel. We will send the rental agreement and price list upon request or after booking. The property is part of a large gated community of lake-front properties, accessed by a private road. Santiago Atitlan, which has a couple of good restaurants, is easily accessible by taxi (only about 15 minutes away). We recommend arriving by car or private van. If you have a car, please pay close attention to the driving directions. Google Maps will often lead you the wrong way! In general, you want to arrive via the coastal road from Guatemala City or Antigua. You do not want to take the InterAmerican hwy to Panajachel. If you do not have a car, please let us help you arrange transportation! Please note that there are no large grocery stores on this side of the lake--just small tiendas and the local mercados. We recommend that guests stop on the way and pick up groceries. There is a small but well-stocked store in Santiago (Simone's) on the tourist street across from Coffee Eiffel. Panajachel has several grocery stores, and San Pedro has an excellent health food store. Please note that the chalet is in a wooded area. While we do our best to keep spiders out of the house, they do come inside--especially when there is a change in the weather. Our staff looks for and removes spiders, but if you see one they missed, please tell them so they can take care of it for you. Traci is from San Diego, California. She left a career in technical communication with a Fortune 100 company and moved to Guatemala in 2011. She bought Lake Villa Guatemala to host personal retreats and welcomes guests for either vacation rental, personal retreats, or all-inclusive vegan workshops. Mark has lived at Lake Atitlan since 1981. He is a musician who has played all around the world. He regularly plays in Panajachel, and he and Traci perform together in Panajachel and Santiago Atitlan. Have you ever gone someplace new that immediately felt like home? That's how Lake Atitlan felt to both Mark and Traci, though 30 years apart. When Traci knew she wanted to move to Guatemala, she looked at several properties. Stepping off the boat onto the Lake Villa Guatemala beach, she knew this was the place. There is nothing like sitting out on the patio, surrounded by nature: the sights and sounds of the birds, the wind in the trees, and the gentle lapping of the lake down below. We love to have our morning coffee or watch the changing colors of sunset from the patio. Trees surround the house, and the property feels like a luxurious oasis in a private park. We are 3km from Cerro de Oro and 5km from Santiago, and 1km down a private, gated road. The area is very private and quiet, without the noise that is common in Guatemalan towns. Santiago Atitlan is a traditional Mayan village, filled with history and culture. Many guests visit the Catholic church-the oldest in the lake area-built on the steps of a Mayan temple in the 1540s. Most of the rooms in the house have a lake view. We have a small private beach and private dock. From there you can swim, kayak, or just enjoy the beautiful views. Toliman volcano is behind us and visible from our upper garden. Our dock has a beautiful view of San Pedro volcano. The house looks out over the lake to the hillsides on the other side of the lake. Telephone is available for local calls only. Space heaters are available if needed, but the house generally stays a comfortable temperature. High quality cotton bedding is provided. The washing machine is available for rentals of two weeks or longer. Laundry service is available. The dryer is available for rentals of two weeks or longer. Laundry service is available. Fireplace in the main living area. From the sofa in the main living area, you can see both the fireplace and the lake. Large open living space with lake views, opening onto a large patio. We even have an electronic piano and a guitar for the musicians! Basic spices and essentials are included. Two tables can be used separately to seat 8 or joined to seat 12. One television is hooked up to satellite TV on the second floor. Satellite TV (Claro), premium services. Most stations are in Spanish, with some English available. We have several books by local authors that give insight into Guatemalan life and Mayan culture. There are several small lawn areas, including on the lake shore, and at the top of the property surrounding the fountain area. The lower two bedrooms open on to a small balcony with access to the path to the lake. Full use of two kayaks are included in your rental. Both are sit-on-top style. One is a single and the other a double. See the lake in style in our private boat. The cost of the boat rental depends on how long you're out and how far you go and includes the boat captain. The top deck has three small tables and seating for 8. The lower deck is open and is a lovely spot for yoga. We're so glad you enjoyed your stay. We hope you'll choose our home again if you return. We were welcomed at the gate by two wonderful care takers. The house is beautiful with 3 floors and 2 giant patio areas in addition to one more walking to the pier. We chose the bottom floor since the windows looked out on the lake. The kitchen, dining, and living area are beautiful. We cooked breakfast and dinner and during the day we were out. We connected with a great bird guide recommended--Rolando Tol Gonzalez (ask Traci). We had 3 wonderful birding days seeing 50+ each day in different areas. This was an awesome place to unwind after birding and we hopped in the hot tub, which is cleaned after each visitor! Boating to the other towns is great and trust Roberto to take you. We felt well looked after and appreciated the hospitality of all we met. GREAT HOME and say hello to the resident cat Tigre who always showed us new things to see. We're so glad you enjoyed your stay. Wonderful that you were able to see so many birds and take advantage of the hot tub and the boat. We hope you will stay with us again if you return to the area. Our extended family had a great time at this beautiful Santiago Atitlan refuge. The house has great appointments, including a free standing spa, which our 8 year old twin daughters just loved. Bring your own items to be cooked in the wonderful kitchen since the village of Santiago may not have what you want to cook or where to eat. We absolutely loved our stay. Bring that book that you wanted to start or finish. We're so glad you enjoyed your stay, and thank you for sharing your experience! We hope you'll come back again. Traci's house is absolutely gorgeous. Kitchen has everything you need, all you have to add is food. The house has three levels with a spacious kitchen, dining room, living room, and full bathroom on the first floor, a master bedroom/bathroom on the second, and two bedrooms and full bath on third. Beautiful manicured grounds, and a direct view of Lake Atitlan. She has two men, Pedro and (? can't remember his name?) who speak no English, but are ready and willing to help with whatever you need, including a boat taxi across the lake to any of the little lakeside towns. Traci was available to answer any/all questions we had, and provided great suggestions for restaurants and outdoor activities. For the price, it's unbeatable. Thank you for choosing our home as your base in Lake Atitlán. It was a delight to meet you and your family. 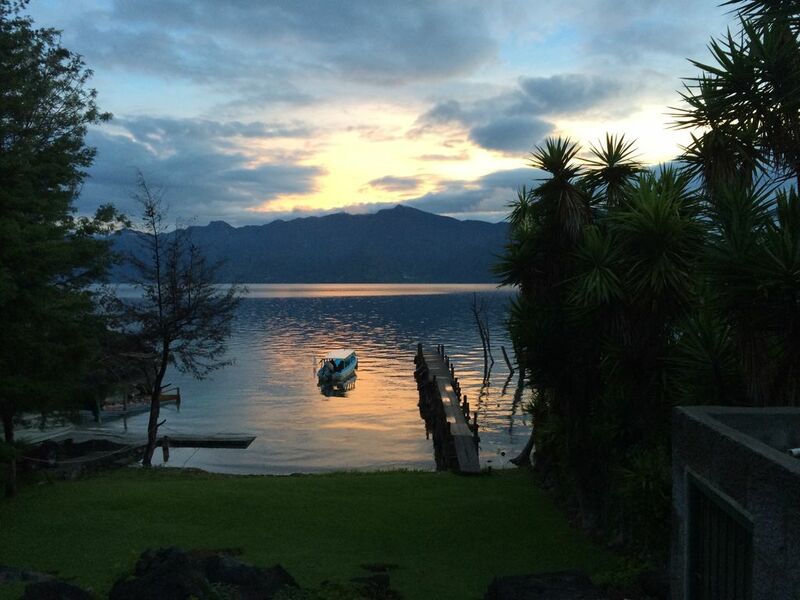 We"re so glad you enjoyed our little slice of Atitlán heaven! This house was everything we expected. It was well equiped for cooking large meals for our group. I highly reccomend this for breakfast and lunch, since it is a decent trip, by boat or car to a restaurant. There is on site staff for assistance and questions, they were very helpful. The rooms and beds were comfortable. The internet was down for a day, so know that the tv relies on your laptop, so load a couple of movies or pack a few books before your trip. The privacy and solitude is very relaxing. The scenery is equisite. I wish we had stayed longer, we will devinitely be back. Thanks for the review: we're so glad you enjoyed your stay. Thanks also for pointing out that we don't have TV. The internet is usually great, but the huge windstorm when you were here knocked out power in Panajachel, which took down our internet. We're glad you appreciated our onsite staff. They really are there to make life as easy for our guests as possible. Man, we saw more rain at Lake Atitlan than we've seen in years (some of us are from California) but, still, never cared much since the house we rented from Traci was fantastic. Perfect for six people who love to share a lounging space, some musical instruments, a top-notch kitchen, a hot tub and a view to die for. Yup, it's a little removed from town (Santiago) but that didn't stop us from getting out a few times. My nephew and I flagged down a passing pickup truck on the road up the hill, in the pouring rain, and took that into Santiago. Not for the faint of heart but there if you'd like it. However, Traci provides a couple of phone numbers for drivers, as well as a boat to rent which is expertly captained by Pedro or Roberto, the two most-excellent caretakers at the property. We loved those guys. The house's many levels spill down the hillside toward the lake which creates one fantastic view after another and, my god, cannot speak more highly of the hammocks hanging out down toward the dock. Santiago, the nearest town, is small and very walk-able and is a little on the "rougher" side, meaning a little more "real" feeling. Seems like tourism and its ills are only now starting to make their way through the economy. San Pedro, a very cool destination for a day trip, is larger, a little cleaner and somewhat more tranquil seeming. It's filled with Spanish schools and gringo-friendly (not a bad thing, just saying) restaurants and very mellow salespeople hanging around. Throw in a few smelly hippies and a large dose of evangelical Christian churches up the hill and you have a great cultural mash up in the most beautiful of settings, Lake Atitlan. Do yourself a favor, just go. Stay at Traci's house, bring a few of your most favorite people in the world and you'll never regret it. Lake Atitlan is home to 12 Mayan towns and villages, each with a distinctive personality. Most of our guests visit Santiago Atitlan, only 15 minutes by car or tuk tuk. Many take our private boat to the charming village of San Juan, which is home to several painting and weaving cooperatives. San Juan specializes in natural dyes for their cloth: something you won't find in the rest of Guatemala. A trip to San Juan is often combined with a stop in San Pedro, which has good restaurants and the lake's only health food store. A visit to Lake Atitlan isn't complete without a stop in Panajachel. Our private boat takes you there in about 20 minutes, or you can travel like the locals on public boats. In Pana you'll find restaurants, handicrafts from all over Guatemala, a couple of small museums, and a great zip line and nature reserve. If you're more adventurous, the hike up Cerro de Oro is short but steep trek, with beautiful views and a stunning Mayan altar. The trail head is only a 10 minute drive from our location. If you're extra adventurous, take the boat to San Pedro and hike San Pedro volcano. The trail is well-maintained but steep. Unless you're in stellar shape, plan on 5-6 hours hiking. Rates are subject to change until the reservation is confirmed. Please be aware that there are no grocery stores in this part of the lake. There are wonderful local markets for fresh produce, and small stores with some staple items. If you are coming from Guatemala City or Antigua, we recommend picking up groceries there before coming to the lake.